British Cycling is not "at desperation stakes" yet, says performance director Stephen Park, despite the team winning just one gold medal at the Track Cycling World Championships in Poland. Britain could only finish sixth in the medal table - but were 10th four years ago in Paris before going on to win 12 medals at the Rio 2016 Olympics. "It is too early to be writing Britain off yet," said Park. "Medallists who went to Rio were just emerging as riders at this stage." The championships in Pruszkow concluded in disappointing fashion for Britain as they failed to win a medal on the final day. Elinor Barker's opening-day gold in the women's scratch race was followed by silver medals in the men's and women's team pursuit on day two. But Ethan Hayter's bronze in the men's omnium on Saturday ended up as the only addition to their tally. With the Tokyo Olympics now 508 days away, Park said there was plenty of time for Britain to close the gap on their rivals. Britain's cyclists have dominated track events since the 2008 Olympics in Beijing, where they collected 14 medals including eight golds. That was followed by eight golds at London 2012 and six at Rio (where they collected 12 medals overall). You can look at the medals and the finishing positions but you can look deeper and look at the performances. There's a lot to take heart from. Ryan Owens in the team sprint had an excellent first lap. Jack Carlin off the back of an amazing year wasn't quite at his best but he has a bright future. We need that little spark - when you get a confidence boost and morale it's infectious. Hopefully Jason Kenny's amazing form will come back and reignite everyone. You spend the first two and a half years of the Olympic cycle trying new formats, trying new people in different positions and bringing younger riders through. And by now you really want to have an A squad and know what your formation is going to be so you can really focus. Great Britain are renowned for peaking at the right time though. And in my opinion, in Ed Clancy, they have the greatest team pursuit racer on their side, so you never now. 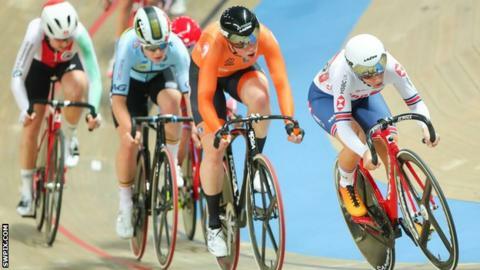 Britain's hopes of a medal in the men's madison on Sunday disappeared as Hayter and Oliver Wood faded in the closing stages of the 50km race. Neah Evans was seventh in the women's points race, in which Ireland's Lydia Boylan took silver. And Katy Marchant lost out in the women's keirin at the quarter-final stage. The 26-year-old had received a reprieve in the first round repechage when New Zealand's Olivia Podmore was relegated. However, the spark that carried her to a silver at the World Cup in New Zealand in January was absent as she exited the competition. "I was just having one of those days where I couldn't execute what I wanted to," she said. "It's been a long season and it has taken its toll. This is not where we wanted to be right now but unfortunately we have not been able to pull it together. "I have every faith that we are aiming towards Tokyo gold medals."